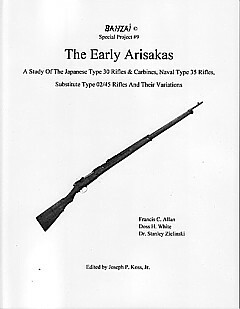 A Study of The Japanese Type 30 Rifles & Carbines, Naval Type 35 Rifles, Substitute Type 02/45 Rifles and Their Variations. Edited by Joseph P. Koss Jr.
Each Copy is $25 shipped in the continental U.S. Overseas slightly higher. This book covers the design, development, production, and known history, of these 'forgotten' rifles. The Early Arisakas were the first Japanese rifles designed for use with smokeless powder and marked one of the first steps in Japan's march to super-power status. This book contains pictures and tables of the rifles, variations, and their markings, along with recorded features and serial numbers of surviving specimens. Most serious collectors consider having 1 of each model or type a complete representation of these rifles, but after reading the book, I'm not so sure that just one of each is enough. The book identifies original production stamps, inspection marks, modifications and variations , along with those that were added or modified later by the Japanese and the other countries where they saw service. I didn't realize the extent of service use by the European countries of these early Arisakas. In all this is a very in depth look at these early Veterans of Japanese Military service. I highly recommend this book for your reference library. Copies can be purchased directly from the Authors, price is $25 postage paid in the continental U.S.
for details on how to purchase your copy today. I got my copy the other day and I'm with you. It's a Very Nice book with tons of information in it. If you collect Japanese rifles, then you need this book in your collection.